In keeping with my thoughts about creating tavern signs for establishments that once existed (the approach I have called "historical fiction"), I have forged ahead with yet another historical treasure. 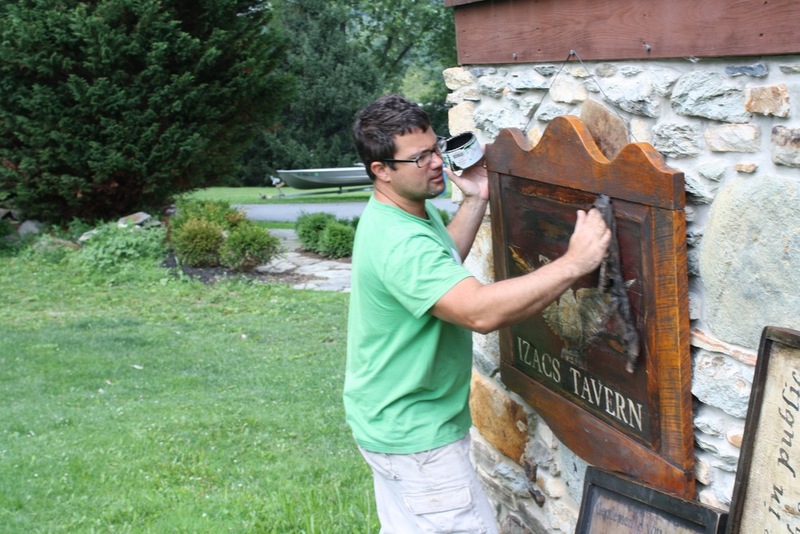 This time, I attempted to breath life into what has been called "America's first tavern". The Bell-in-Hand Tavern in Boston claims to have poured the first draft of cold beer in the year 1795. Serving as a busy hub for printers and politicians, sailors and students, in no time at all, this New England watering hole established itself as the most prominent alehouse in Boston. The first owner of this famous establishment was Jimmy Wilson. The name sounds quite common to our modern ears, and in the streets of Revolutionary Boston, it was one that, more than likely, every Bostonian knew very well. What was it about his tavern that made his name so familiar to everyone in Boston? Well, for Jimmy Wilson, such "fame" (as we refer to it today) derived initially from the fact that he, for some fifty years, had served as the town crier to his beloved neighbors. Being the bearer of news (good, bad or indifferent), Wilson had established himself within the hearts and minds of his city's populous. When he retired from his long-tenured post, he decided to open a bar. It would only seem fitting that his choice in naming this tavern be "The Bell-in-Hand". So, what was so interesting about Jimmy Wilson's tavern? Well, this tavern not only insisted in the exclusive serving of ale (as opposed to the litany of standard liquors popular at the time), each drink order was served in two mugs. Apparently, one mug was used for the ale; the other held its frothy byproduct. As thick as the news Wilson had, for so many years, dispensed to his fellow citizenry, so too was the elixir served from his tap. To this day, this tavern is in full operation - 45 Union Street, Boston, MA. Obviously, the establishment has changed substantially in both appearance and tradition. I mean, surely Jimmy Wilson would appear puzzled to learn that the Bell-in-Hand rocks a Facebook page! The menu offerings have inevitably grown to meet the needs of Boston's thirsty inhabitants and visitors. Within the rapid pace of Boston's daily life (considered a 'rat-race' to many), the cacophony resulting from the hustle and bustle can easily find its way from the streets into establishments like the Bell-in-Hand, attempting to distract us from enjoying a small piece of mind whilst in the company of our good friends and a cool beverage. Despite this, I'll wager that - if one stops to listen very hard (even during happy hour) - they just might hear the sound of a singular bell ringing, finding its way through the thick crowd of this glorious alehouse... an echo which began in the wake of the Revolution; one that today reminds us of our American spirit and the need to unite with our fellow man / woman over a cold mug of ale. So, after my digging and learning about this amazing tavern, I located a very interesting panel that once rested inside a shutter, possibly a door. The physical surface was perfect for this venture, as I proceeded to apply layers and layers of paint, in hopes to create the appearance of a substrate that had bore witness to years and years of experience amidst a tavern environment - the smoke, soot, changes in temperature, sunlight, occasional repair / repainting, cleaning, and the possible slight alteration here and there to the sign's design. My aim was to create something that would have functioned as a secondary sign, not the main exterior billboard that would have graced the exterior. This sign would have rested above the fireplace mantel, possibly behind the bar... in either case, a product of pride in the establishment; one that reminded the customers within that they were indeed, even if for a small time, a true part of this environment. The color choices - red and teal/green - might appear strange at first. However, by integrating this scheme within multiple layers of varnish and washes, the results are harmonious. I particularly enjoy seeing the highly saturated versions of the red and green poke through here and there, even though they are present in small and subtle measure. The gravy-brown tonality serves to unify the entire sign, holding the visual aesthetic together. As of today, this sign is available for purchase. This is an original work and rather exclusive, so I encourage you to act swiftly. I may or may not choose to make more like this, but am certain that there will not be two alike... the panel used for this sign was a true maverick, hiding deep within my stockpile of surfaces. Please let me know if you have any questions or would like to see additional photos of this piece. Thank you for reading! The finished sign, available for purchase.